Prime Minister Antonis Samaras appears to have lost both legally and politically in his bid to shut down Greece's public broadcaster, ERT. The Council of State, the country's highest administrative court, on Monday night was preparing to publish a decision that would force Samaras to re-establish ERT's signal, which has been off the air since last Tuesday on government orders. ERT employees have continued to put out a signal via the internet. "The decision corroborates the abolition of ERT and its board," Finance Minister Yannis Stournaras said." He said the decision also instructed him to "broadcast from a public entity until the new public broadcaster is up and running." The government spokesman has said that this will be done by the end of August. The Council's decision appears to mean that the government may proceed with its restructuring of the state broadcaster, scheduled to be completed by the end of the summer, but may not keep it off the air in the meantime. During the course of the evening Samaras held a three and a half hour meeting with his disenchanted junior coalition partners, socialist leader Evangelos Venizelos and Democratic Left leader Fotis Kouvelis, to hammer out a common position. "We're waiting for the prime minister to interpret the [court] decision correctly," Venizelos said, emerging from the meeting. Samaras offered to reshuffle the government at the end of the month, and to re-examine how decisions are made and announced as concessions to his partners, the prime minister's head of communications said. The concessions underline the extent to which Samaras' government has been shaken by the events of the past week. His coalition partners have publicly disagreed with his unilateral decision, but are also making a stand on the rubric of the coalition's mode of collaboration. Socialist leader Evangelos Venizelos, speaking of conservative premier Samaras and his party, told Sunday newspaper Real, "New Democracy's plan [for ERT] was known to all the media... We knew Mr. Samaras' intention. He knew we completely disagreed. What would happen in any other European country with a coalition government? Would one partner proceed without a parliamentary majority?" But the most unanimous public and political condemnation has focused on the act of taking state television off the air. The European Broadcasting Union's president, Jean-Paul Philippot, visited Athens last Friday to deliver a rebuke to the government in person. He called for the re-establishment of the signal "immediately" and said that allowing journalists to do their job was "non-negotiable". In defiance of the government-enforced closure, the EBU carried Philippot's press conference in Athens via the ERT signal. The EBU is the governing body for all European public broadcasters, but European outrage has gone beyond it. The day before, Council of Europe Commissioner for Human Rights Nils Muiznieks told the Associated Press that the move "deals a heavy blow to a fundamental pillar of democracy." The autocratic style in which Samaras closed ERT has played into the hands of his political opponents at home. Media unions declared rolling 24-hour strikes in all private media, which have lasted for seven days. On Monday night Alexis Tsipras, leader of the main opposition party, Syriza, held a rally in Syntagma Square to capitalise on the government's faux pas. "I'd like to inform the prime minister about something he refuses to understand: Mr. Samaras, you're finished.," Tsipras said. "Let me repeat that to make sure you've got the message: You are finished. Whether you patch things up with your allies tonight or not, goodnight to you. Just leave the silver, please, because it doesn't belong to you. It belongs to the Greek people." This was the first major political event not to be covered by Greek national television in decades, so Syriza installed an eight-camera crew and created its own production, which ERT streamed live. The event, complete with live music, camera cranes and slogans like "we are stopping the catastrophe, we are rebuilding Greece," had the feel of an election rally. New Democracy and Syriza are running neck-and-neck in the polls. A Kapa Research poll for the Sunday edition of Vima gave them 21.4 percent and 21.1 percent of the popular vote, respectively, with 19 percent of the vote undecided. The poll was conducted on June 12-13, when the ERT controversy was raging. 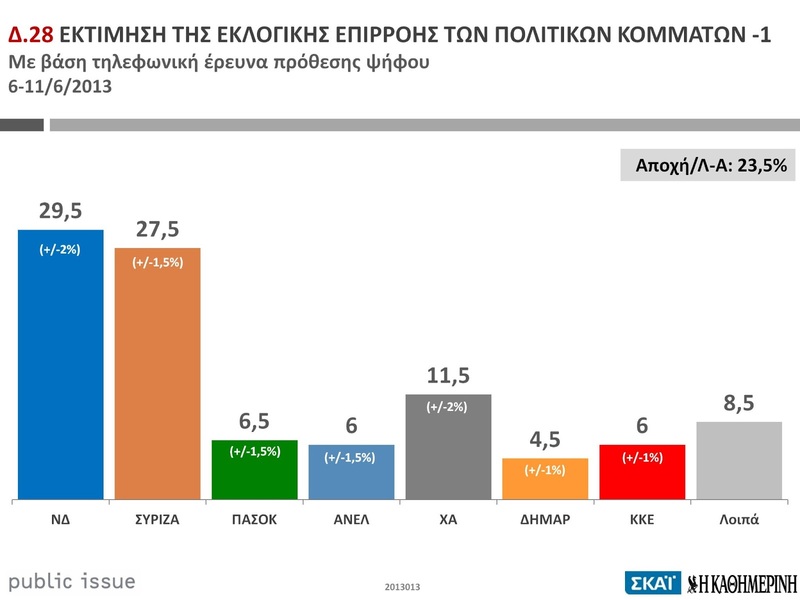 A Public Issue poll conducted for Skai/Kathimerini on June 6-11, just before the controversial closure, found the pair polling at 29.5 percent and 27.5 percent of the vote respectively.